Volatile Organic Compounds have been found in two private wells in Winnebago County. The Health Department is investigating and distribting flyers to homes in the area of suspected contamination. “At this point in time, we do not know for sure how extensive this groundwater contamination problem is. Our Department is working in partnership with the Illinois Department of Public Health to evaluate the scope of the problem and to inform residents of the health risks. We are in the process of evaluating the extent and direction of flow of the VOC contaminate plume in the groundwater”, states Larry Swacina, Director of Environmental Health Services for the Winnebago County Health Department. Vocs can be effectively removed with the proper fitration methods. Our Water Quality Association Certified Water Specialists are standing by to answer your questions about water contaminants and how to remove them. See the full story on the WREX 13 website. A new report by the Battelle Institute revealed that water softeners can save significant amounts of money and energy in the home. Click here to see a release from the study, commisioned by the Water Quality Research Foundation. In a hard water area, having a water softener and reverse osmosis drinking water system reduces greenhouse gases in an amount equivalent to getting one-and-a-third cars off of the road for an entire year, according to a study by chemical engineers, John and Candace Blount. Click here for full story. Residents of the Gem Suburban mobile home park are being urged to have their wells tested for trichloroethylene. For a link to the news release and more information, click here. For more info on trichloroethylene, see the story and links below, in the Rockford Groundwater Contamination article at the bottom of this page. An activated carbon filter, ANSI approved or NSF certified under standard 53 will remove this contaminant from drinking water. A carbon showerhead filter is also recommended to avoid breathing the vapors in the shower. 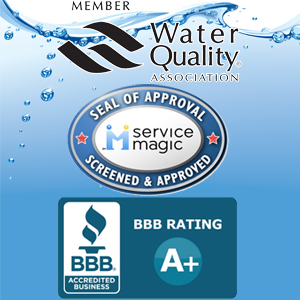 Call us for information on the right treatment for your water. Click here and then on the video to see us in action! The Better Business Bureau now rates companies by letter grade…A-F. We are proud to announce we were rated A+! Also, we just recieved our 2011 Complaint Free Year Award. Way to go, team! The Illinois EPA informed Rockford’s Department of Public Works of confirmed detection of TCE, trichloroethylene, in the groundwater. Go to the US EPA site for more info on TCE Health Effects. American Water Treatment can help you find the right treatment for TCE and many other contaminants in your water. Call for a free water analysis today. We also take samples for full-spectrum tests, call for current fees.